Brandon Roy is possibly on the verge of a breakthrough season for himself and the talent-laden Blazers. 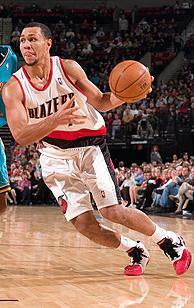 Consider me one of the hesitant members on the Brandon Roy bandwagon. The appeal is understandable: he is a smooth player with scoring and passing ability playing on a young, talent-laden team on which he is the undeniable leader. The primary concern is that makes it hard to anoint him as a top 40 pick is that he has had injury setbacks in each of his first two seasons. And the added talent in Portland decreases the chance he’ll average more than 20 points per game, though a bump in assists could be the end result. Roy is not a player who manhandles any one category, but he’ll give around 18 points and six assists with one 3-pointer and one steal per game. If his FT% bounces back from last season’s .753 to the .838 mark of his rookie campaign, it would be a huge help. When to take him: In the fifth round. Even those of us who expected a strong season from LaMarcus Aldridge in 2007-08 were pleasently surprised. In addition to the getting major minutes, his per minute numbers skyrocketed and he averaged 17.8 points, 7.9 rebounds and 1.2 blocks in 34.9 minutes per game. The return of Greg Oden can actually be seen as benefit to Aldridge, who will no longer be the sole focus of interior defenses and can possibly find a little more freedom underneath. Oden is expected to be a strong rebounder but not much of an offensivre force, so expect Aldridge to score a little more and ptentially reound a little less. Aldridge’s soft touch resulst in a solid FG% (.489 career) and his FT% improved from .722 in his rookie season to .762 last season. He’ll still be the team’s top offensive option inside and there is no reason to expect a drop off. When to take him: In the fifth round, shortly after Roy. After missing his rookie season due to knee surgery, all reports indicate that Oden is ready to take the NBA in his massive, there-is-no-way-he-is-only-20-year-old hands. Oden is not going to be Shaq part II though. He will be among the league leaders in rebounds but will average somewhere between 10 and 12 points per game because of his limited offensive repertoire. He’ll also block more than two shots per game and shoot better than 60 percent from the floor, scoring mostly on dunks and layups. It’s fairly safe to expect those numbers from Oden and he can be drafted like a player who has done it before. The only drawback is that this – technically – is his rookie season and he may get fatigued as the season goes along. Also….no idea how that knee will be holding up over the long haul. The depth of the Blazers is due to their excess of talent, but it also means they will hard pressed to find enough minutes for all the players that are worthy of them. Travis Outlaw had a strong 2007-08 season, averaging 18 points, 6.2 rebounds, one steal and one block per 36 minutes. He may land the starting small forward job and playing more minutes alongside the Blazers starting talent will be enough to make him a late-round pick. Martell Webster was a great 3-point specialist for Portland last season but is already out for two months with a broken foot. That opens the door for Spanish rookie Rudy Fernandez, who coach Nate McMillan promised would see significant minutes. He probably won’t provide any more than late-round value, but he could be worth a shot. Steve Blake will be the team’s starting point guard and will have a fair amount of assists and 3-pointers but he is a streaky shooter and shaky defender and played less than 30 minutes per game last season. That leaves more minutes on the floor for rookie Jerryd Bayless, who could be one of the true impact rookies if Portland gives him the starting job during the season. There is a soft spot in my heart for the perennially under-appreciated Joel Przybilla, but it’s hard to see where he’s going to get enough minutes with Aldridge and Oden around. Always worth a look if you need rebounds and blocks though.